Renovations recently completed in 2018! Flooring upgrades include new carpet in the top level main living area and staircase, as well as Luxury Vinyl Planks in the kitchen, mid-level hallway and rec room/laundry area. A complete remodel of the kitchen has been planned, starting with a new breakfast bar layout that will increase the overall square footage of the space. Brand new cabinets by Waypoint will be installed with LED undercabinet lighting, topped with quartz countertops from Cambria and finished off with a blue mosaic glass tile backsplash. A new sink and range will complete the kitchen upgrades. To carry the design throughout the great room, the mosaic glass tile used in the backsplash will be repeated on the fireplace in the living room, as well as the quartz for the hearth. The top level master bathroom vanity will also receive new sinks and faucets installed in a new quartz countertop. Situated on a private, expansive, over two acre oceanfront lot. Exquisitely decorated with ocean-theme art and accessories. Stainless Steel Kitchen appliances and High Efficiency Washer and Dryer are provided for your convenience. 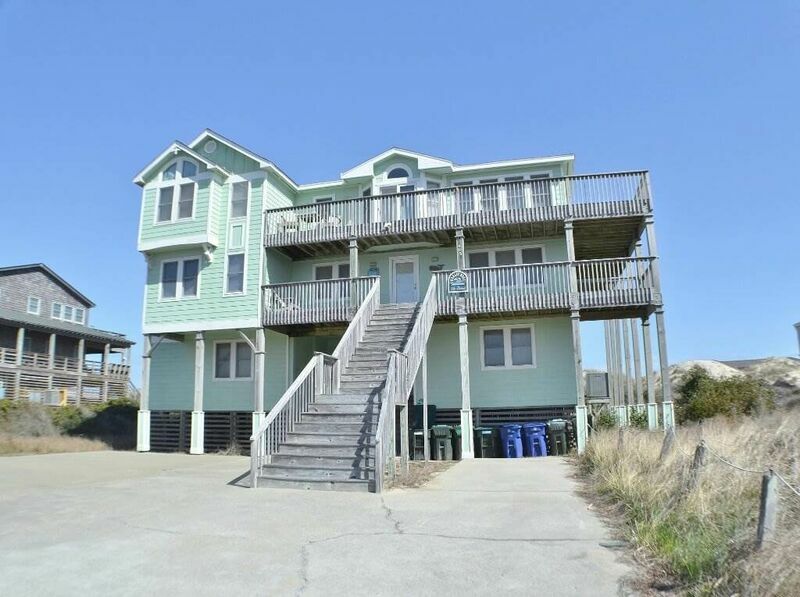 The private boardwalk and dune-top deck lead to beautiful South Nags Head beach. This spacious home (> 5,000 sq. ft.) has two beautiful, bright vaulted great rooms that afford breathtaking ocean sunrises. An additional private sunroom enjoys serene sunsets over the National Park. This fully equipped home features an elevator, spacious decks with ample Adirondack chairs, Private Pool, Hot Tub and screened-in porch with ocean views. Come relax and enjoy! GROUND LEVEL: Enter through the Covered Porch to the Game Room with TV/VCR, Stereo w/CD Player, Free Wireless Internet, Wet Bar, MW and Full Refrigerator. This room has an Oak Pool/Billiards Table and Foosball which provides entertainment options for adults and children. A Surround-Sound Home Theater with 65" Large Flat Screen TV/DVD/VCR has Reclining Leather Chairs and Ottomans with well stocked DVD and Video Libraries. This room can be configured for business meetings using Two Six-Foot Conference Tables stored in a closet. Located off the Game Room is a Bedroom with Bunks, Full Bath with Walk In Shower and Laundry Facilities. Door off Game Room leads to Enclosed, Lighted Swimming Pool Area, Gas Grill, Lounge Chairs, Two Storage Bins Containing Beach and Pool Toys, Enclosed Outdoor Lighted Shower with Dressing Area. Lighted Fish Cleaning Station with Sink, Pool Area leads to Lighted Boardwalk. New hot tub overlooks pool. LEVEL 1: The Grand Exterior Staircase leads you to the Entrance and Foyer. Five Bedrooms and a Den are located off the richly wainscoted Hallways. A Private Den with Queen Sleeping Sofa provides a secluded Get-A-Way or serves as a Ninth Bedroom. Down the hallway from the Den is elevator access and a spacious Sound-Side Queen Master Bedroom with TV and Double Vanity. To the right is an additional Sound-Side Queen Master Bedroom with TV and Beautiful Sunset Views. An Oceanfront Bedroom has a Pyramid with Trundle, Oceanfront Queen Bedroom with TV and King Master Bedroom are on this level. Hallway leads to Deck Access, and Screened-In Porch overlooking Private Pool and Ocean. LEVEL 2: Stairs lead to newly carpeted Living Room with Vaulted Ceilings, Gas Fireplace, 42" TV, Office Nook with Desk, Stereo w/CD Player. Oceanfront King Master Bedroom with Double Vanity Bath has TV and Private Doorway to Exterior Deck. Sound-Side Expansive Vaulted King Master Bedroom has Jetted Tub, Double Vanity, TV/DVD and Walk In Shower. The newly remodeled Kitchen with antique ivory cabinets and woodplank flooring features quartz countertops, a Large Refrigerator, Smooth Surface Range and is overly equipped to please the Chef in the family. A second Granite-Surfaced Wet Bar/Kitchen with extra Refrigerator and DW is available. Hardwood Floored Living Room with Expansive Seaside Vistas Viewed through an Oceanfront Wall Of Glass. Primary Dining Area has a Large Table with Sound View and an Entrance to Deck. This Dining Area leads to an Arched Entrance to the Secluded Sunroom with TV/DVD/VCR, Games and Stocked Bookshelves. There is also a Half Bath on this level.